Artillery pieces are expensive to cast; as a result, they tend to be in service until captured, destroyed or rusted away. Sakers are a prime example of this, as many of the barrels date back to the 17th Century, even if they have been taken from dust-covered warehouses and mounted on refurbished carriages. They are relatively light cannons in terms of the shot fired, which is much the same as a six-pounder. Some sakers are even old enough to have been intended for stone ammunition, and this is reflected in the fact that the windage (or difference between the barrel bore and shot size) is often quite large. This “rattling” of a shot down the barrel when it is fired does not help accuracy. Despite the light weight of shot, sakers are anything but lightweight guns. Saker gun carriages are large, awkward and tactically immobile. Gunners and draft animals can drag them into place before a battle, but there is little chance of moving a gun to a better firing position once the action has commenced. 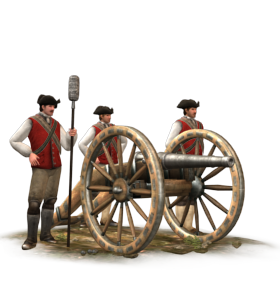 Although obsolescent, there were 14 sakers in the “Blenheim train” of artillery in 1704 available to the Duke of Marlborough – guns were expensive and he took what was available. Cannon foundries not only make guns, but also ammunition and the associated equipment for artillerymen. They are hot, dangerous places to work.